The Nikon CoolPix S9900 has been designed as an amazing travel camera, with a feature set that is ready for any situation. Less than outstanding image quality is the only thing that stops us from giving a full recommendation. Read more in our Full Conclusion. 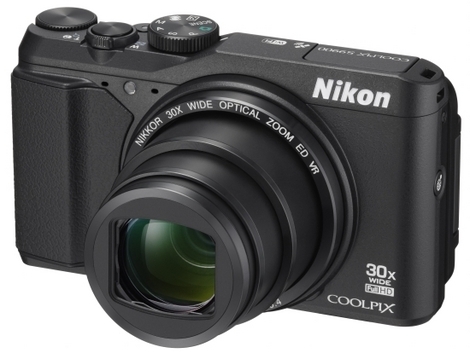 The Nikon Coolpix S9900 is a compact, long-zoom digital camera that's perfect for those who need a telephoto lens, but still want to travel light. The 16-megapixel CMOS image sensor is mated to a 30x optical zoom lens. It can record Full HD video, and Nikon also included a Time-lapse video feature. There are automatic as well as manual exposure control modes, built-in GPS, Wi-Fi, and NFC technologies for geo-tagging your pictures down to the exact latitude and longitude, and then sharing them via compatible smartphones and tablets. Finally, the high-resolution 3.0" Vari-angle display offers flexibility for taking dynamically angled shots as well as good old selfies. The Nikon Coolpix S9900 is available in black or red for $349.95. See our best price box at the top right of this page to see current online pricing.